STUNNING LAKE VIEW! CUSTOM BUILT 1500sq BUNGALOW ON PILES. BRIGHT OPEN CONCEPT KITCHEN WITH QUARTZ ISLAND AND COUNTERS, STAINLESS APPLIANCES. GREAT ROOM FEATURES STONE ACCENT WALL WITH FIREPLACE, 9' CEILINGS AND BUILT-IN SURROUND SOUND, POT LIGHTING. UPGRADED FIXXTURES, 4PCE ENSUITE BATH, WALK-IN CLOSET, HI-END FLOORING THROUGH OUT. FINISHED OPEN BASEMENT FEATURES LARGE RECROOM AREA AND THIRD BEDROOM. 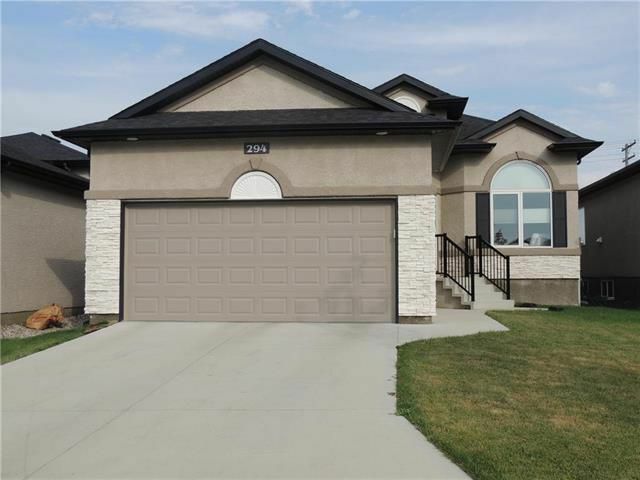 DOUBLE ATTACHED INSULATED GARAGE, LARGE DECK OVERLOOKNG PROFESSIONALLY LANDSCAPED FENCED YARD WITH INGROUND SPRINKLER SYSTEM. CENTRAL AIR, R/I VACCUUM, ALARM.